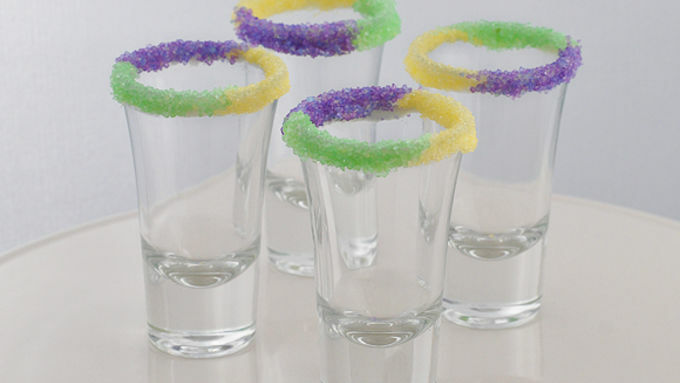 Dip the rim of each shot glass into the vanilla frosting, then dip 1/3 of the rim into purple sugar sprinkles, 1/3 into yellow sugar sprinkles and 1/3 into green sugar sprinkles as pictured. Set glasses aside. 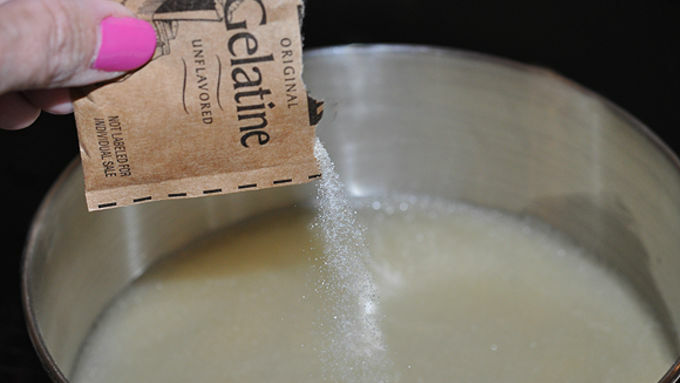 Pour lemonade into a small saucepan and sprinkle with gelatin. Allow to soak for a minute or two. Heat over low, stirring constantly, until the gelatin is dissolved (about 5 minutes). Remove from the heat, stir in cake vodka and sweetened condensed milk. Divide gelatin mixture between 3 bowls (about 1 cup in each bowl). Use liquid food coloring to color each. FOR PURPLE: 4 drops of NEON purple. FOR YELLOW: 4 drops of regular yellow. FOR GREEN: 4 drops of regular green. 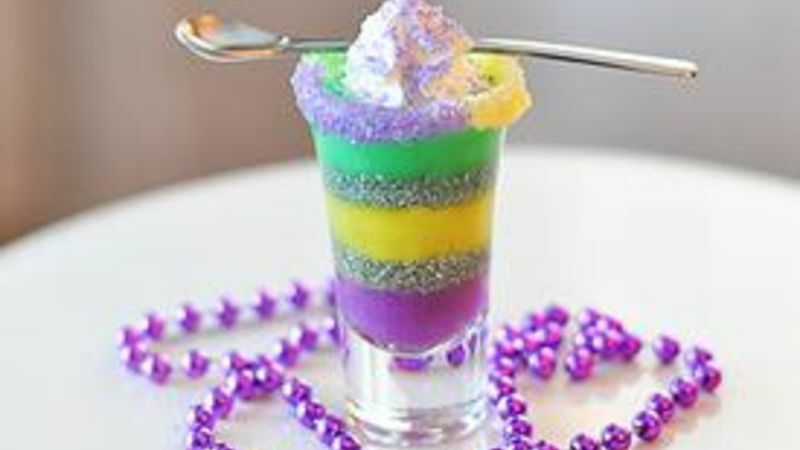 Use a food baster or tablespoon to add about one tablespoon of the purple gelatin to each of the shot glasses. Refrigerate until set but still sticky when touched, about 20 minutes. Remove glasses from fridge and sprinkle one teaspoon of silver edible glitter over purple gelatin. Tap gently to even out. Then carefully spoon or squirt about one tablespoon of yellow gelatin into each glass. Refrigerate until set but still sticky, about 20 minutes. 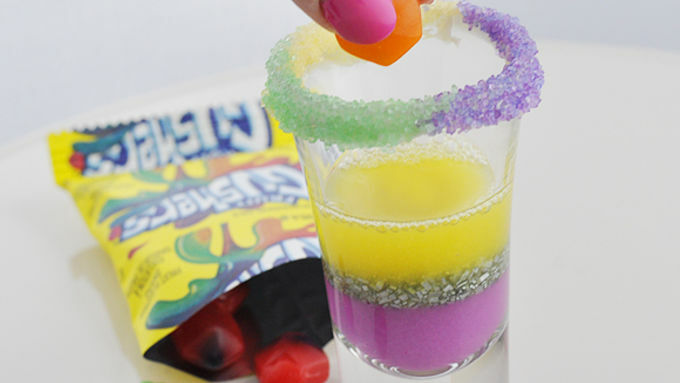 *ABOUT THE GUSHERS™ CANDY: If you want to hide a surprise in one of the shot glasses (in King Cake tradition), drop one Gusher™ into ONLY ONE of the shot glasses after pouring the yellow gelatin. Refrigerate with the others until the yellow layer is set but still sticky, about 20 minutes. Remove glasses from fridge and sprinkle one teaspoon of silver edible glitter over the yellow gelatin. Tap gently to even out. Then carefully spoon or squirt about one tablespoon of green gelatin into each glass. Refrigerate at least two hours or overnight until fully set. 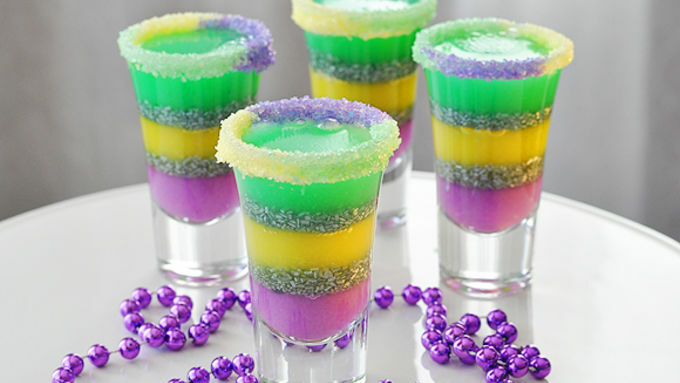 Jelly shots as colorful as the Mardi Gras flag. Pretty cool, huh? I've never really been the type of gal who takes shots. I realize the irony in this as I just showed you these Oyster Shots. And yes, these King Cake Jelly Shots are completely insane and ridiculous. But uh, isn't Mardi Gras completely insane and ridiculous? Yes. Yes, it is. What's King Cake? Do you know the tradition behind the king cake? I just learned this. Apparently, it's served as a celebration during the carnival season, which is Epiphany (typically Jan 6th) through Fat Tuesday (February 21st). And get this. A tiny plastic baby (representing baby Jesus. No, I'm serious.) is INSIDE the cake, and whoever gets the slice with the baby in it has to make the cake the next year. But, he or she is also granted privileges and powers like magical Leprechaun tales. THESE THINGS HAPPEN AT MARDI GRAS. So, instead of cake, I went with cake vodka (my new boyfriend) and condensed milk (my new husband) and went the shot route! Oh, and instead of a baby (sorry, but that'd be weird to stick a baby in a shot), I stuck a fruit Gusher in one. It was better for my mental health. Let's get ready to celebrate Mardi Gras! Variations Go all out with whipped cream and sparkles like they're pictured in this recipe, or make 'em much simpler and easier if you want without the whipped cream topping OR the silver glitter layers. Or with just the gelatin layers -- no rimmers, glitter or toppings -- still gorgeous with just a couple purple candy pearls on top! It's up to you! Now, who's gonna get the baby Gusher……? I actually wouldn't mind a leprechaun tale.